For today's Ruby Tuesday I have some really RED flowers to show you. 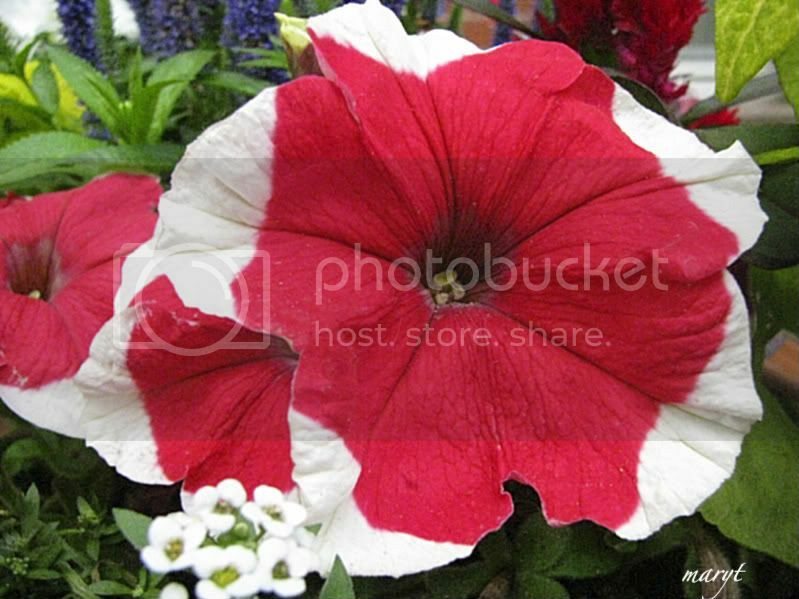 These are RED and white petunias growing in Brooklyn where my grand-nephew lives. Aunt Rose, my SIL, shows Jarome the flowers. I like the macro shots. I hope you do too! So now what you have to do is sign Mr. Linky and leave a comment. You'll do that won't you? Oh and don't forget to visit other participants. 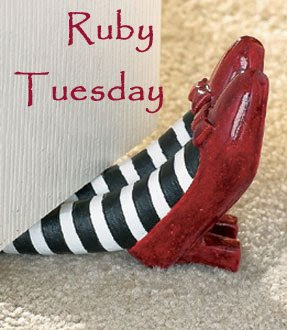 I am posting Ruby Tuesday at 2:00 PM EST on Monday to make it a little easier for our friends in other parts of the world to post at an earlier hour. Well... I'd sign Mr. Linky if he was around to sign. Elusive little beggar that guy. Ruby Tuesday #42: "Red Fish"
BTW, are those flowers as big as they look?? If so they're HUGE! Even as a macro they look enormous! But I love that splash of red in the center. Looks very... Harvard. Nice work! Mine are red or white. I'll have to come back midst in the late English crime to sing in for Mr. Linky. Maybe a task for Hercule Poirot? That is a beautiful planter full of lush beautiful flowers! I love the macros Mary - very vibrant! I think Jarome is looking at something beyond the flowers - may be his bubble machine:)I've never seen those flowers in two tone coloring - I've only seen the sort that they are all red or purple. Very impressive! Ah, Mr. Linky plays elusive! And what pretty red/white petunias you posted, Mary! P.S. I voted for you on some link that had blogs by women. Most of the blogs I hadn't heard of. These petunias are a stunning shade of red! Beautiful collection of photos! I DO like your macro shot. Petunias are such perky flowers...especially in res trimmed with white! Jarome with the flowers : I wish he may keep that wonder, this admiration for plant life, all his life. The enlarged petals gives us an explosion of ruby and some intriguing imaginative ideas; a parachute? A balloon? A Quilt? This flower really leaps at us with style and flair! they look so cute and beautiful! My journal arrived today and it is very nice. Thank you again for the award. The petunias are so pretty! Beautiful! I love the two colored petunias and the flower box is gorgeous! Gorgeous Mary. I don't think I've ever seen Petunias so BIG. Love their fragrance. Wow! Those petunias are like, as big as saucers! OK, not quite, but my eyes are big as saucers looking at them! You even captured a red light in the window!! How pretty! I love the red, white, and purple. 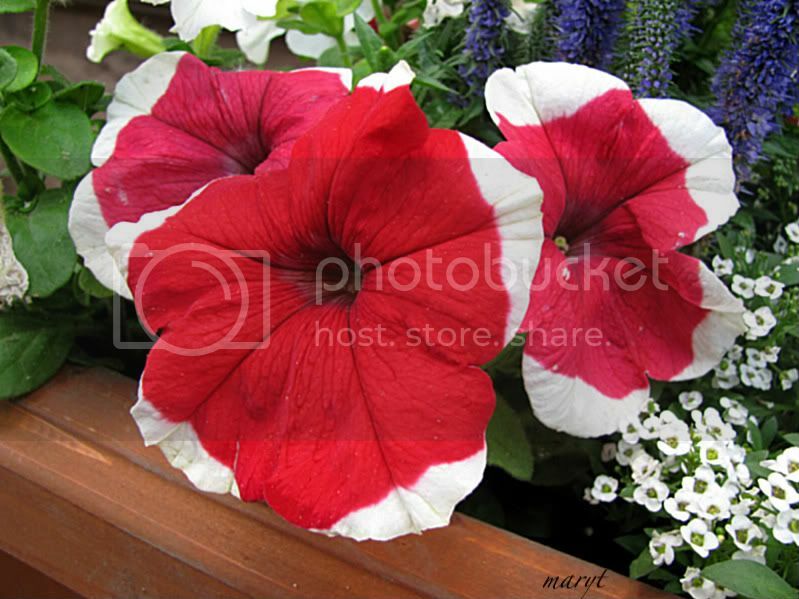 Red and white petunias,perfect for Ruby Tuesday! My, what huge petunias you have! Beautiful. I really like the Petunias, do not think I have ever seen ones like that. I love working with the marco lens. I love the two colour petunias. beautiful photos Mary. Thanks for Ruby Tuesdays. I enjoy it. They are lovely mixed in with the other colors. Beautiful! Just beautiful the color is so vibrant! Those petunias are huge! I've got flowers, too! Love your title shot of the vase of flowers, beautiful! What beautiful petunias, Mary! The contrasts of tones is wonderful! Their vibrancy is lovely. I like your big flowers, did they come from Texas? i do! those are very extra ordinarily red and white blooms. lovely! Beautiful flowers for today's meme. Beautiful ! and I am so angry because my red petunias were all eaten up by an army of snails ! Beautiful flowers - the variegated ones are so pretty! Thom told me about the petunia's, and indeed, they ARE great Mary!! And I am indeed a great fan of macro shots! Very nice work! Pretty flowers, they are huge too ! Do they always get that big ? I am back again because I seem to have disappeared from Mr Linky! So I tried again and thought I had better put a link here too. I love those two tone petunia's. they are so cheery. I loved your macro flowers, I love macro anything, and your grand-nephew is so cute! Gorgeous petunia! In fact, all the flowers/colors in that grouping are beautiful. Awesome close-up and I really like the look on the sweet child's face. Red and white flowers??!! They are phenomenal! Beautiful petunias. Love the colors. Beautiful Petunia's! I just planed some myself. And they are red! I'll have to get some photos! Mine is posted. Have a great day!! Those are terrific petunias. I'm a big macro fan...beautiful photo. Gorgeous flower box. Mojo is right... the petunias do look huge... and beautiful. When I think of petunias I always think of the Jones Beach. Haven't been there in centuries, but they used to have petunias along the walk ways there. You got great macro shots of some beautiful petunias, Mary! Those are some amazingly RED petunias! I saw some great RED snapdragons the other day when I took Bessie to get some heliotrope, but of course I didn't have my camera! 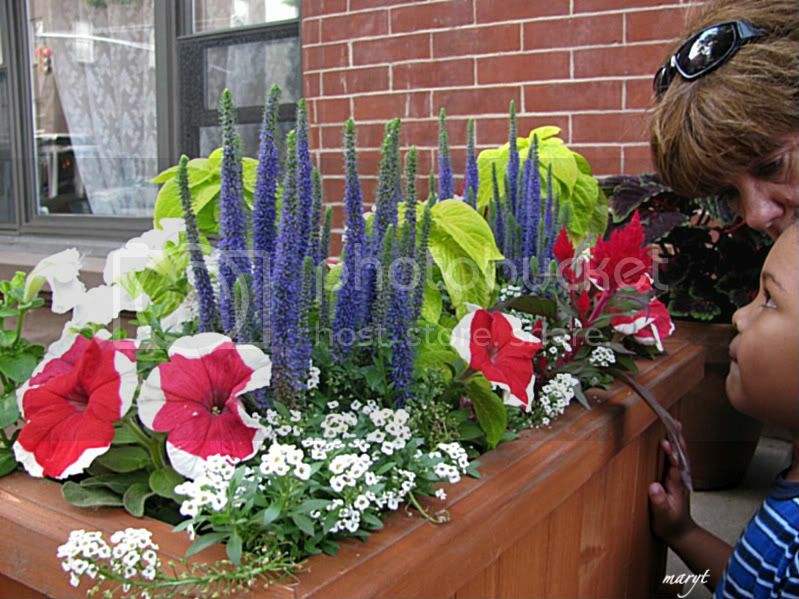 I love the red/white/blue effect with these petunias, the alyssum, and the spikes of blue salvia. I also did a red flower today - hope you can stop by and see it when you get a chance. Beautiful flowers, beautiful family, thanks for sharing. Thanks for hosting this meme, I just joined about a month ago and LOVE IT!! you know the flowers are so beautiful but you can only know and guess what my favourite picture is eh? well it's the one where you can just catch a small glimpse of your little great nephew! My RT entry is up! Amazing Petunias by the way! Petunias are such fun to grow. They never seem to fail. Beautiful photo. Thanks to Ellievellie, I found your excellent site and I've posted on it. Sorry I'm so late. I always love flower close ups! Nice shots! Hope Jarome has a lifelong love of flowers. I've got ruby red Chinese lanterns this week for all of you. They are so lovely , it's a perfect combination of colors. Those macro shots are great!